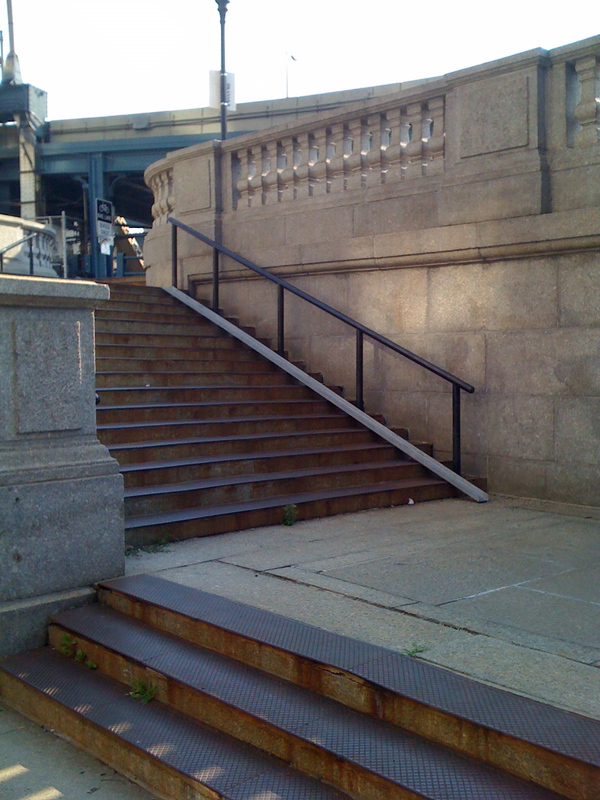 The two sets of stairs have channels along side them so that cyclists can guide their bikes with ease. After that, it’s smooth sailing. DOT had staffers on hand to pass out maps in the pedestrian plaza, which is now the main throughput for cyclists as they go up to the bridge. As I rode this morning, I was pleasantly surprised. The new Brooklyn-side approach offers only the most minor of inconveniences, and as long as cyclists take things slowly on that tight switchback it shouldn’t be much of a problem. To be fair, I wanted to chant ma nishtana as I saw this, but an NYPD van at this location on this day seemed like salt in the wound on this first day out. 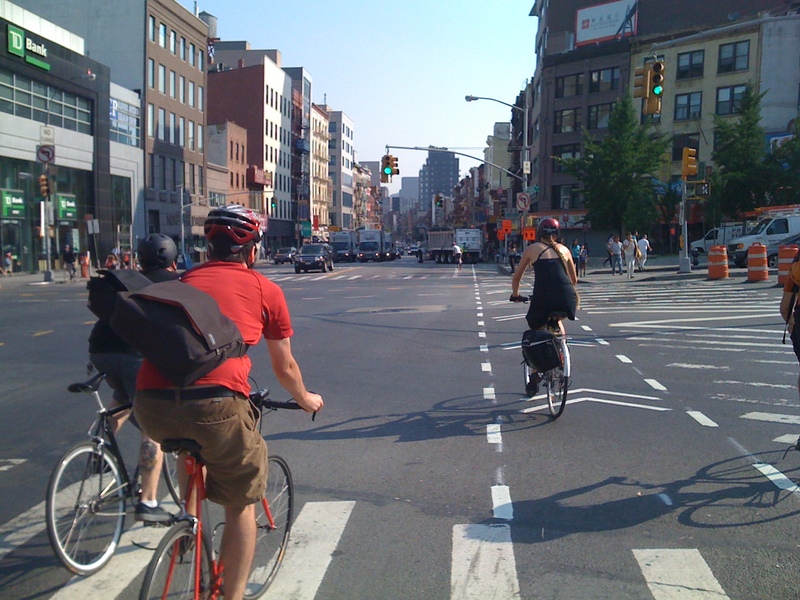 Once bike commuters cross Canal Street they have to ride up Bowery. And that’s when things go from merely inconvenient to downright deadly. I simply can not believe that DOT will allow cyclists to continue to ride this way, although one DOT staffer I spoke to on my way home admitted that they are hoping cyclists will find other safer routes. (“I probably shouldn’t be saying this,” she said.) I don’t see how it’s possible to avoid the Bowery, at least for a block or two, and if you want to go uptown there’s no way around crossing Canal. 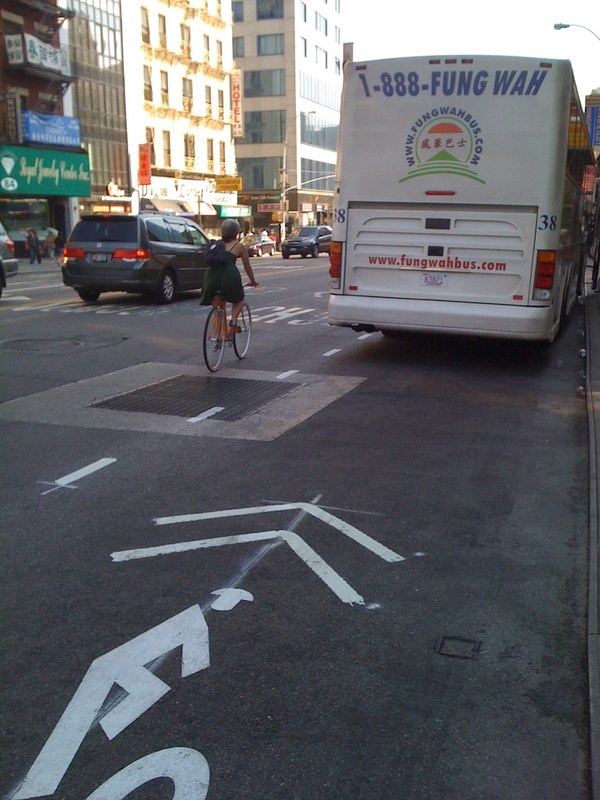 The Bowery may as well have not been marked at all, given the frequency with which the bike symbols, dotted lines, and sharrows were ignored. And without enforcement or barriers to standing, the problem is only going to get worse as this new configuration becomes routine within a few weeks. Here’s a similar, but different van, just a block ahead. You can see a line of cyclists having to ride between the parked vans and moving traffic — which, curiously was also made of a lot of vans. It’s a dooring accident waiting to happen. I believe the planning for this new route represents a major failure of DOT’s primary responsibility, which is to keep people safe as they move around the city. An inconvenient route borne of the necessity of a bridge repair is one thing, but a dangerous one is something completely different. I understand that the department was tasked with finding an uptown route for cyclists that connects to various crosstown bike lanes, but the cycling infrastructure provided — if you can call what DOT provided infrastructure — is woefully insufficient. 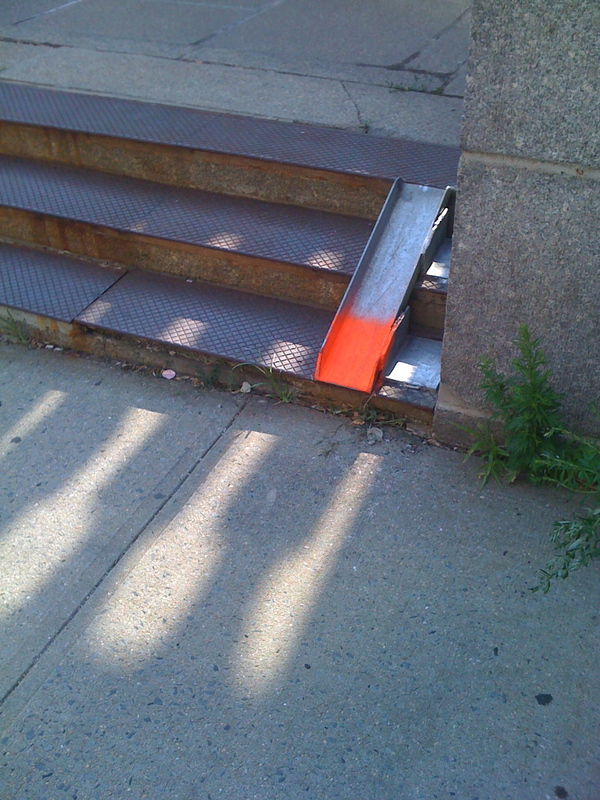 Tiny orange signs affixed below traffic signs tell drivers “No standing,” but signs aren’t enough to keep New York City drivers out of no standing zones. What is needed along the Bowery is a mix of bollards, jersey barriers, and other features that will keep cars and bikes separate from each other. 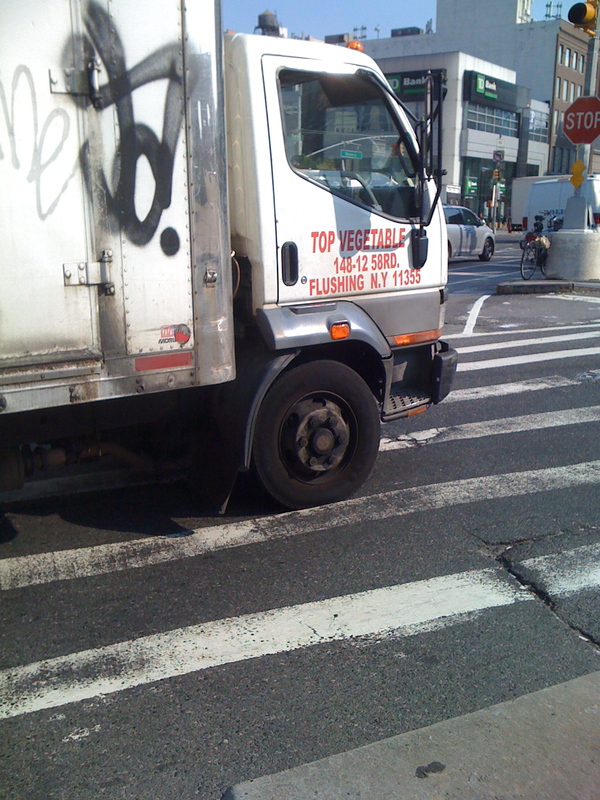 I am sympathetic to the reality that many of the businesses along the Bowery need the curb space to make deliveries, so perhaps DOT could place designated loading areas every block or two. 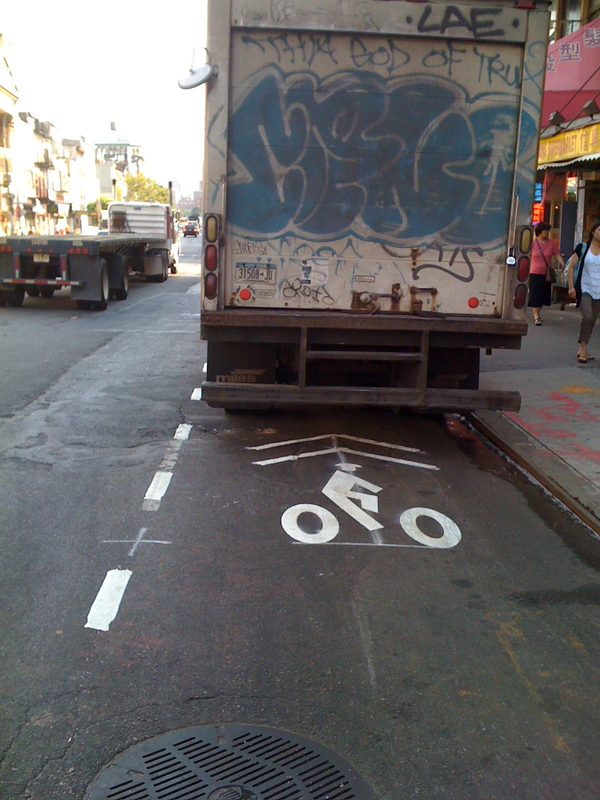 If business owners complain, DOT can tell them what they’re telling cyclists: it’s only temporary. Sadly, I am almost certain that a major injury or death will occur on this route. I can’t imagine that a new cyclist — someone who may have only started commuting by bike this summer — will be all that encouraged to keep riding if this is what greets him in Manhattan every workday. Whatever gains the city has made in ridership over the Manhattan Bridge in recent months are likely to be erased until next spring. And that’s just the ride in. Later, I’ll post about the ride back to Brooklyn, which was fraught with its own host of dangers, including more discount buses. You didn’t even mention the biggest problem of all: that for 153 hours a week, there isn’t even a pretend detour route. The “detour” only even theoretically exists M-F 7-10am. 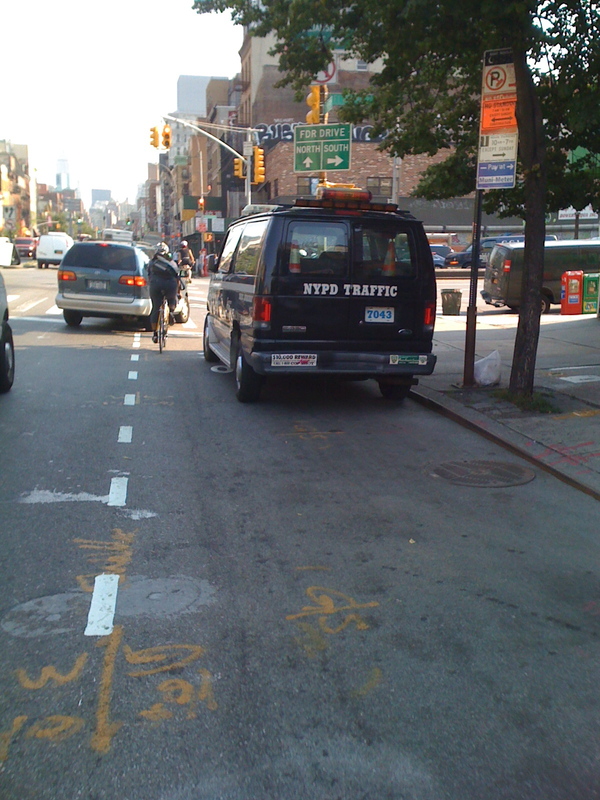 At all other times, DOT says, just go ride in traffic on the Bowery. Good luck! 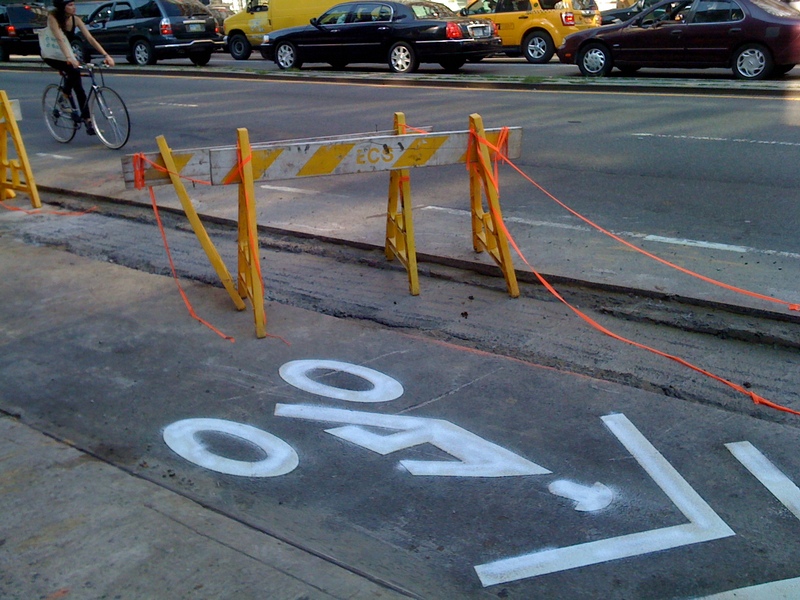 The whining of NYC bike riders 2011 is really pathetic. My, I don’t know how we ever rode bikes here 1890-2010!! Between yokels who’ve never been to the “pedestrian” side (never? know Brooklyn much?) to twitterites crying about every little perceived obstacle in life, ya’ll give more ammo to the anti-bikers than the antagonist themselves. 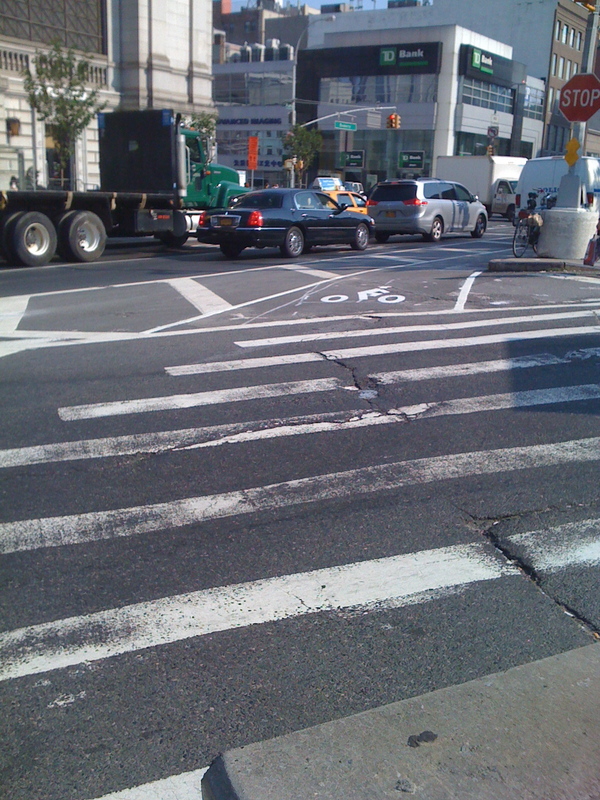 Those of who rode over the south side of the MB already suffer your lousy 1st and 2nd Ave bike lanes, now you’re bitching to the DOT about… what? Everything? I appreciate Brooklyn Spoke but ya’ll really need some PERSPECTIVE sometimes, both historical and cultural. If people REALLY don’t like the MB ride (though many of us did the stairs for years, it’s no big deal and actually kind of fun), go BB, WB or all the way to Queens. Hint: A LOT more people ride the subways over the MB than bike it so we gotta cool it. 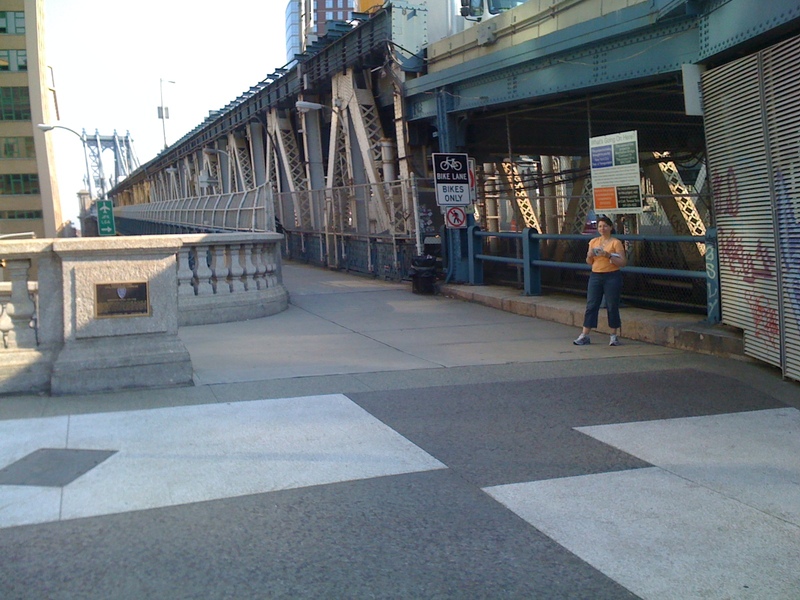 Cross the Bowery at Canal, then head downtown two blocks and go west at Bayard. Left on Mott, right on Mosco, right on Mulberry, after eight blocks, turn left on Prince. Bayard is one way the other way. Mott and Mulberry are extremely congested. Not a good detour. Irina, thanks for your comment. It’s interesting what people read versus what I wrote. 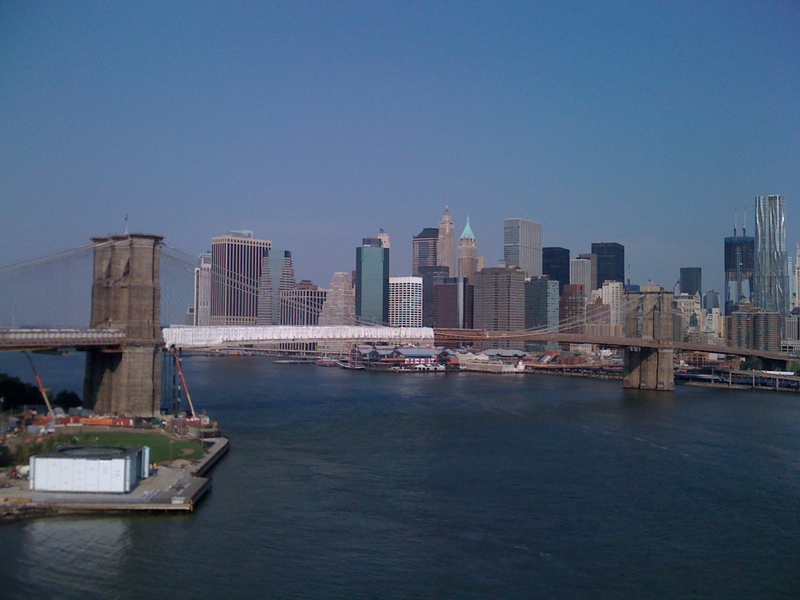 I’ve walked over the Manhattan Bridge many times and admired the view. Now I’m merely happy that one of the upsides of the new commute is that I get to admire it every morning. I’m sure the people who have been walking on the south side of the bridge for years really appreciated you biking there, even though you weren’t supposed to until Monday. You probably gave more ammo to the anti-bikers than the antagonist themselves. > The whining of NYC bike riders 2011 is really pathetic. My, I don’t know how we ever rode bikes here 1890-2010!! > Hint: A LOT more people ride the subways over the MB than bike it so we gotta cool it. You’ve defined the problem well, in spite of yourself. Most people are not comfortable doing what you guys did. That is why they have been riding the subways in far greater numbers than cycling. Most people are, to use your language, pathetic whiners. I don’t know if you want a medal of valor, or what. You are not going to be able to mold the new riders in your image, because if we wanted to ride like you we would indeed have started a long time ago. But you got by before and you will certainly find ways to avoid the new bike lanes and new slow cyclists that you hate. We are trying to gain safe and pleasant cycling routes for the rest of society. We have to do the opposite of “cooling it” to make that happen. We have to be just as demanding as the motorist minority, who have been sucking up all the funds and police protection for the past half century. Irina may be referring to when the south side was the side for bikes. Thanks for the thoughtful piece. At first, I was appalled by the detour, but now, I think it is not so bad. It’s not that I find no fault with the DOT, and I think this could have been better thought out. The main problem is with enforcement and that is true all over the city. 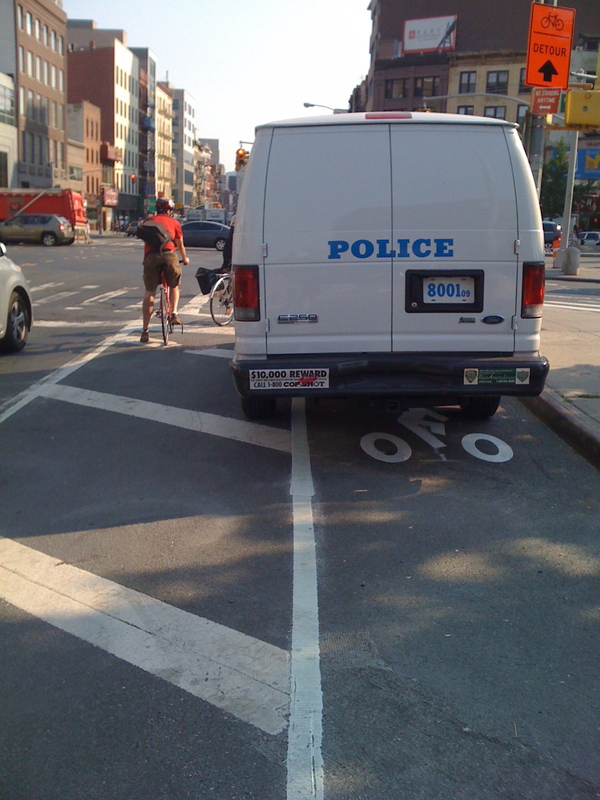 Personally, the Bowery feels safer than the right hooks coming every block of 1st ave in the “protected” bike lane. Sorry Mike, I meant Pell St, which is two blocks south of Canal. You could also stay on Mott, cross Chatham Square and take East Broadway to Pike St, then turn left on the bikeway there. Yes, Mott and Mulberry are congested, like every other street in Chinatown, but unlike the Bowery, they are one-way and don’t have speeding traffic. They are probably less congested in the mornings than the Bowery. Don’t knock it until you’ve tried it. There will never be an untouchable, un-dangerous bike route through the city. If you can’t learn how to negotiate traffic, potholes and pedestrians then yes, take the subway. Really. I find more genuinely dangerous obstacles in the new bike lanes (amateur riders, joggers and pedestrians) than I do in the middle of rush-hour traffic on Bowery or Broadway. 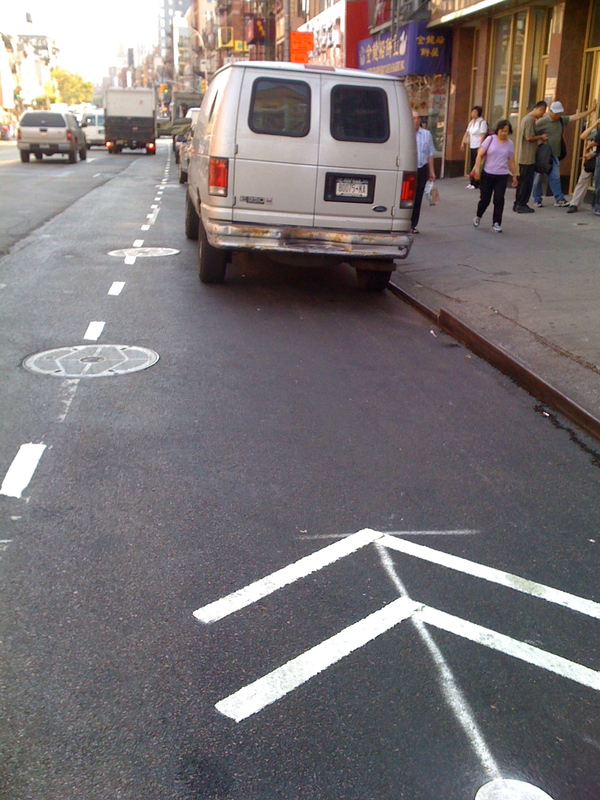 At last there the flow of vehicles protects me from the above bike lane booby-traps. I will not ride on Bowery except to get to Canal. 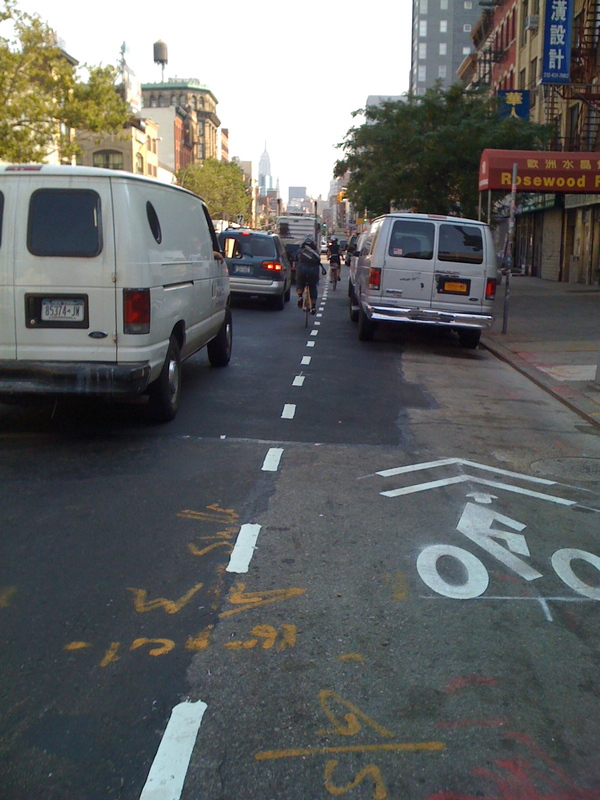 The only way to make Bowery safe would be to build protected median bike lanes and ped islands similar to Allen St.